The main antagonist of the Maple world. 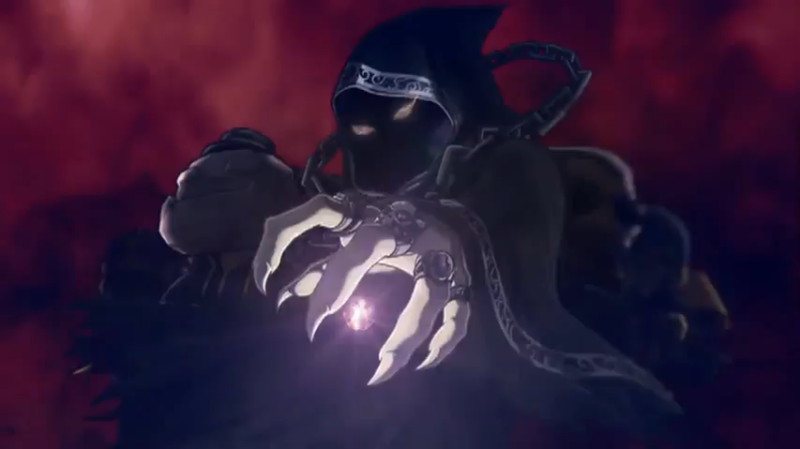 The Black Mage is the one who threatened the world before the time of Altair Camp who was defeated by Aran, Freed, Mercedes, Phantom, and Luminous. He killed Freed and sealed off Aran, Afrien (Freed's Dragon) the other heroes for hundreds of years. Later Empress Cygnus started a new group of knights to assist in defending the world. He would most likely become an extremely powerful monster, possibly even the strongest monster in the game. He owns a unknown fearsome Onyx Dragon (not Afrien), which is presumably very powerful as well. He is heavily involved in the plot of the Arans, Evans, and Explorers, partly because many of the quests involve fighting the monsters that are under his control. The Black Mage was raised in his hometown, Edelstein. Later, he went to Magatia to study alchemy. MapleWorld was chaotic at the time he studied alchemy, and believed that people can't be trusted making their own decisions and believed that there needs to be a king controlling their lives. He rose in power and took over Ossyria, causing a group of explorers to flee Ossyria. He joined forces with Ephenia, queen of the fairies and they both poisoned Ellin Forest. After a long journey through the world, the Pirates came to Victoria Island to warn the citizens about the Black Mage's rising. The Cygnus Knights were formed to battle against the Black Mage. Later, the Black Mage took control of both Zakum and Horntail, creating them into Chaos Zakum and Chaos Horntail. The Pink Bean is defined as the Black Mage's underling. The five heroes of Maplestory had defeated the Black Mage, but not before he placed a curse on each of them which sealed them all for a very long time. Von Leon signed alligance to the Black Mage, after his wife was murdered on the night the Cygnus Knights marched into El Nath, after they got reports saying that he signed alligance to the Black Mage. After the Cygnus Knights "pushed him back to his castle", he signed alligance to the Black Mage, which gave Von Leon the ability to gain vengeance. As a result, the people of El Nath suffered from a mutation that changed them into animal demons. The Black Mage's minions, the Black Wings, resurrected their leader. This caused cataclysm, changing all of MapleStory into a void of Darkness. The Black Wings took over Edelstein. There were some people who wanted to liberate their city, and they formed the Resistance, so they can attempt to expel the Black Wings from Edelstein. In the Temple of Time, the Door to the Future has opened. The door shows that all of MapleStory has been ruled by the Black Mage. In the Door to the Future, Cygnus as well as the Cygnus Knights becomes corrupted, after Cygnus ignored Neinhart's warnings and went to the Tree of Life, thinking that it can make the Cygnus Knights more powerful. It was one of the Black Mage's traps and corrupted Cygnus and her Cygnus Knights. This page was last edited on 7 July 2012, at 08:29.